Bills GM Doug Whaley made an appearance on NFL Network’s All Access program and was asked about a comment made by Bills Wall of Famer Darryl Talley. Talley claimed that Reggie Ragland is the best linebacker drafted by the Bills since Cornelius Bennett. Now in an effort to be accurate, Bennett was acquired by the Bills via trade on Halloween in 1987 in a blockbuster deal with the Indianapolis Colts. Biscuit was also an Alabama product. Either way it’s high praise from Talley. So what did Whaley think of that opinion? “Time will tell but we’re excited about what he brings to our team,” Whaley said. “As coach has always said, what we want to be is a physical team. We want anybody that comes in to play the Buffalo Bills know that they’re going to have to strap that chinstrap up a little tighter and they’re going to know they’re going to be in a fight. That’s what he brings, physicality. 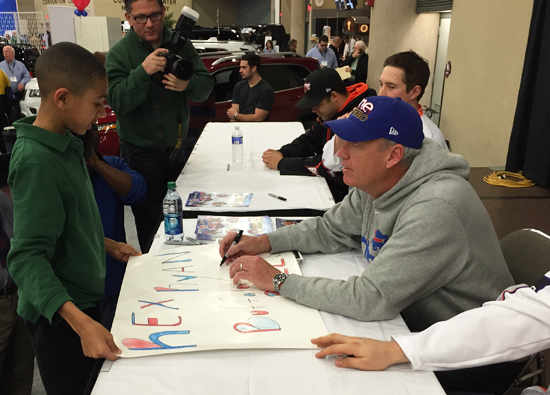 Rex Ryan made an appearance at the Buffalo Auto Show on Thursday. He greeted Bills fans and signed autographs. 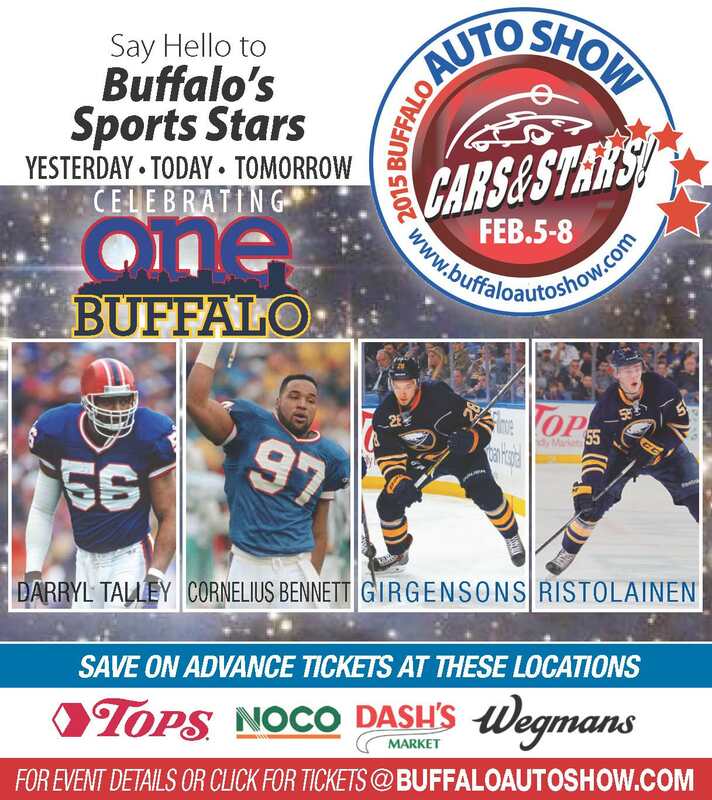 The Auto Show will be celebrating “One Buffalo” all week with various Buffalo sports stars. Rex appeared with members of the Buffalo Bandits and was outfitted in One Buffalo gear. Former Buffalo Bills LB Darryl Talley will be signing autographs and greeting fans on Saturday, February 7 from 5 – 6:30 p.m. Commemorative t-shirts, designed by former Buffalo Bills teammate Mike Hamby, will be for sale with 100% of the proceeds benefiting Talley’s battles against depression and other mental illnesses. This year’s Buffalo Auto Show that takes place at the Buffalo Convention center from February 5 to February 8, 2015 will celebrate One Buffalo and the sports teams that unify our city. The Buffalo Bills will be well represented with various appearances at the event. 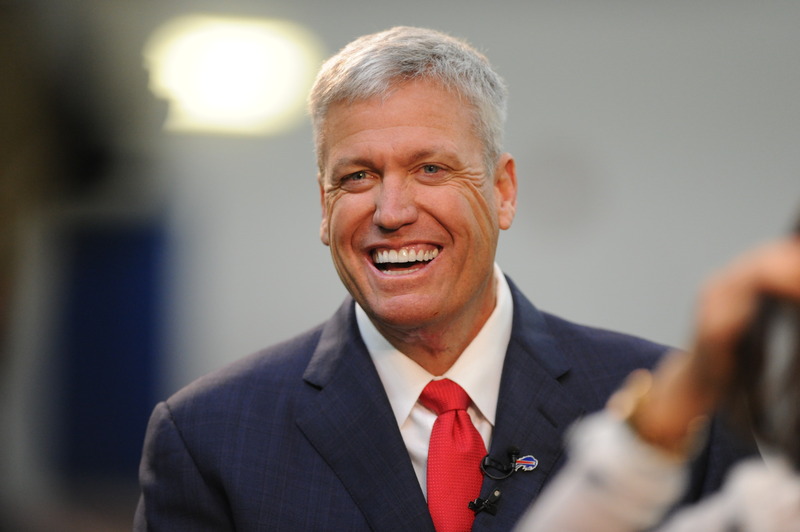 Head Coach Rex Ryan will be in attendance Thursday, February 5 from 6 – 7 p.m.
Former Buffalo Bills LB Darryl Talley will be signing autographs and greeting fans on Saturday, February 7 from 5 – 6:30 p.m. Commemorative t-shirts to raise money for Darryl Talley will be for sale. 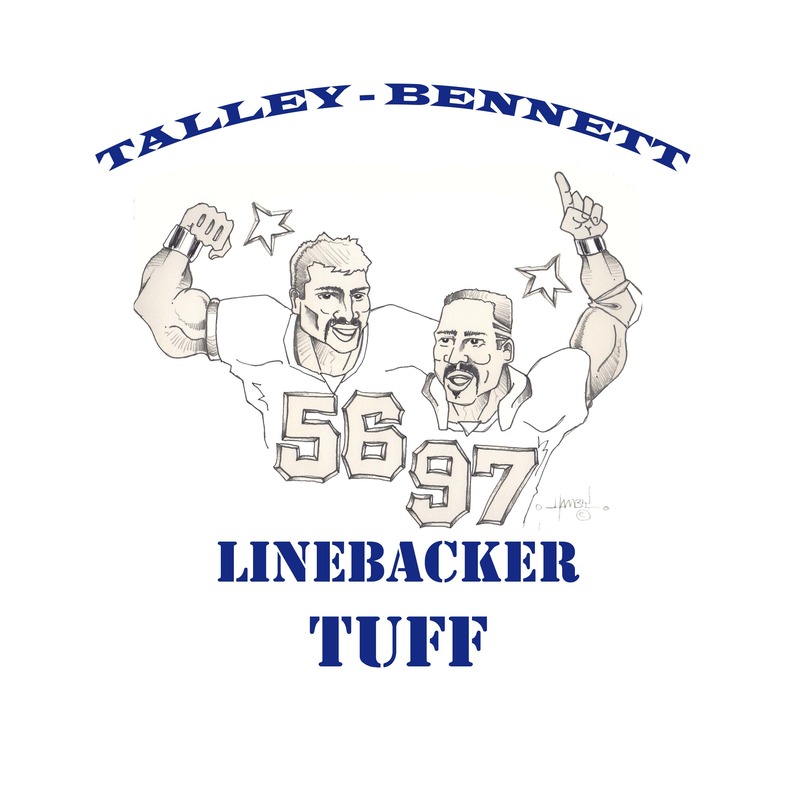 The t-shirt was designed by former Buffalo Bills and teammate Mike Hamby and 100% of the proceeds will go to Talley. For more details about the show, visit buffaloautoshow.com. “Biscuit”-maybe Buffalo’s Best all time LB? When he announced his retirement this week, Chicago Bears LB Brian Urlacher named Ray Lewis of the Ravens as the best middle LB in NFL history. But what about Buffalo Bills history? Last year, an informal fan poll on BuffaloBills.com ranked Cornelius Bennett as the Bills all time LB. It was an unscientific, informal poll with 168 respondents on the website. And 43-percent of those responding ranked “Biscuit” Buffalo’s all time backer. Bennett finished ahead of former teammate Darryl Talley in the fan balloting for the team’s best LB of all time. But “Biscuit” acknowledges that Talley and another Bills LB teammate of his, Shane Conlan, deserve recognition as top linebackers in franchise history. I had the chance to speak with Cornelius Bennett at the Jim Kelly Celebrity Golf Tournament Monday and made sure to ask the former Bills pass rusher about a fellow Alabama product in Bills top pick Marcell Dareus. Bennett was the second overall pick in the 1987 NFL draft taken by the Colts before the Halloween day trade that allowed the Bills to acquire him. ‘Biscuit’ as his teammates called him, would go on to appear in five Pro Bowls including four straight (1990-93) as a part of the Bills four straight AFC Championship clubs. Dareus was the third overall pick. Only one other Alabama player has been taken that high since Bennett went second overall in 1987. It was OT Chris Samuels, who also was taken third overall by Washington in the 2000 NFL draft. Former Bills LB Cornelius Bennett will be hosting a live chat later this morning (Thursday). The chat will begin at 11 am ET and can be found right here. Have your questions ready. Former Bills LB Cornelius Bennett has taken on an important role on behalf of retired NFL players. Named Chairman of the NFLPA’s former player board of directors, Bennett has been sitting in on all of the CBA meetings between the league and the players union. He doesn’t have a vote, but he does have a voice in the meetings, which he plans to use in helping to ensure that former players are properly compensated with respect to health insurance benefits. “The one thing that’s certain is that former players’ benefits have to be improved, both pension and health care,” Bennett said in a telephone interview this week. “That’s my No. 1 fight — to make sure we get something out of the deal, and not just a token. Bennett believes those former players that need the most help are those that played prior to the breakthrough CBA agreement in 1993 that brought the advent of free agency where players really started to make big money. For the first time, the Pro Football Hall of Fame is asking fans to voice their choice for who they think should be inducted into the Pro Football Hall of Fame’s Class of 2010 with a dedicated fan forum. At the Fans Choice Forum you can argue for the candidacy of Bills Wall of Famer Steve Tasker or three-time finalist Andre Reed. Kent Hull, Cornelius Bennett, Darryl Talley, Fred Smerlas, Chris Spielman and former head coach Chuck Knox current join Reed and Tasker on the Hall’s preliminary 2010 induction list. The Hall wants to know what fans are thinking and it’s time for fans to speak up and be heard by casting their ballot! Almost 10,000 fans have already cast their ballot in the first 24 hours! Andre Reed is currently ranked #9 while Tasker is at #17, so get behind your guy and vote!